Researchers at the University of California, San Diego School of Medicine developed a method to expand the types of chromosomal abnormalities that noninvasive prenatal testing (NIPT) can detect. The study, published November 9 by Proceedings of the National Academy of Sciences, uses a semiconductor sequencing platform to identify small chromosomal deletions or duplications, such as occur in Cri du Chat Syndrome and DiGeorge Syndrome, with a simple blood test from the expectant mother. Detecting these types of small chromosomal abnormalities with conventional techniques usually requires an invasive procedure to obtain fetal DNA, such as amniocentesis or chorionic villus sampling. These procedures carry a small but concerning risk for miscarriage and infection. Since the recent discovery that fetal DNA can be found in the blood of pregnant women, NIPT has been increasingly used to detect certain chromosomal abnormalities through a maternal blood test. So far, though, NIPT is typically used only to detect abnormalities that result from larger chromosomal abnormalities — too many or too few of a particular chromosome, for example, such as occurs in Down syndrome. Zhang and his team analyzed blood plasma from 1,476 pregnant women with fetal structural abnormalities detected by ultrasound. These women also underwent an invasive diagnostic procedure and conventional fetal DNA analysis. The researchers compared that information to semiconductor sequencing results on circulating fetal DNA obtained from a blood test on the pregnant women at an average gestational age of 24 weeks. 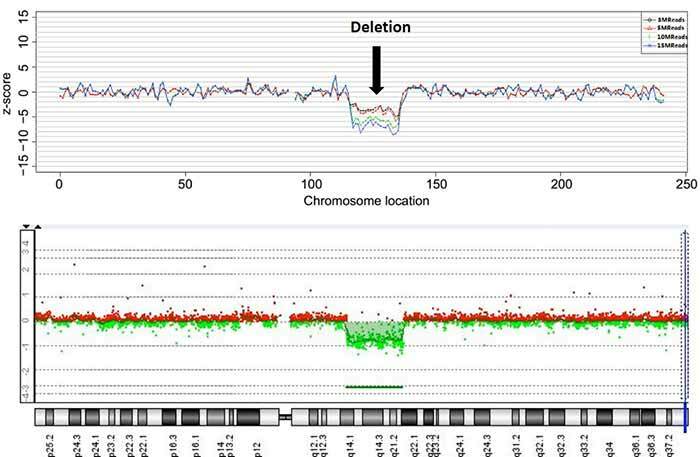 The new semiconductor sequencing method detected 69 of 73 (94.5 percent) of abnormalities of a certain size (greater than one million base pairs) detected by the conventional method. According to the researchers, the cost of NIPT with semiconductor sequencing has the potential to be less expensive than the conventional, invasive prenatal testing method, especially as genetic sequencing technologies continue to decrease in cost. While promising, there is still need for improvement before this NIPT application can be used clinically. In the study, semiconductor sequencing detected 55 false positives, of which 35 (63.6 percent) were due to maternal, rather than fetal, chromosomal abnormalities. That means the new method will require a validation test to screen out maternal abnormalities. NIPT with semiconductor sequencing also needs to be tested at early time points in the pregnancy — at 12 to 16 weeks — and the researchers hope to further improve the technique to be able to detect even smaller genetic abnormalities. The problem is that the more variations they are able to detect, the more they are likely to pick up chromosomal deletions or duplications of unknown clinical significance or with mild clinical consequences. Many of the abnormalities detected could be normal inherited variations. “If our NIPT extension is put into clinical practice, great care must be taken in presenting results and providing appropriate counseling to patients,” said Zhang, who was also the founding director of the Institute for Genomic Medicine at UC San Diego School of Medicine. Study co-authors include Ai-hua Yin, Guangdong Women and Children Hospital and Guangdong Thalassemia Diagnostic Centre; Chun-fang Peng, Dong-hong Luo, Hai-liang Liu, Yang-yi Chen, Quan-fei Huang, CapitalBio Genomics Co.; Xin Zhao, Jie-xia Yang, Jian Liua, Wei-wei Huang, Chang Liu, Jing Wu, Ming-qin Mai, Fang-fang Guo, Yi-ming Qi, Dong-mei Wang, Yu-nan Wang, Guangdong Women and Children Hospital; Bennett A. Caughey, Michael Ai, Rachel Q. Xue, Michal Krawczyk, Daniel Zhang, Michael Karin, UC San Diego; Rui Hou, Lianghong Zheng, Kangrui Biological Pharmaceutical Technology Co.; Mindy Zhang, West China Hospital and Sichuan University. This research was funded, in part, by the National Science Foundation of China.